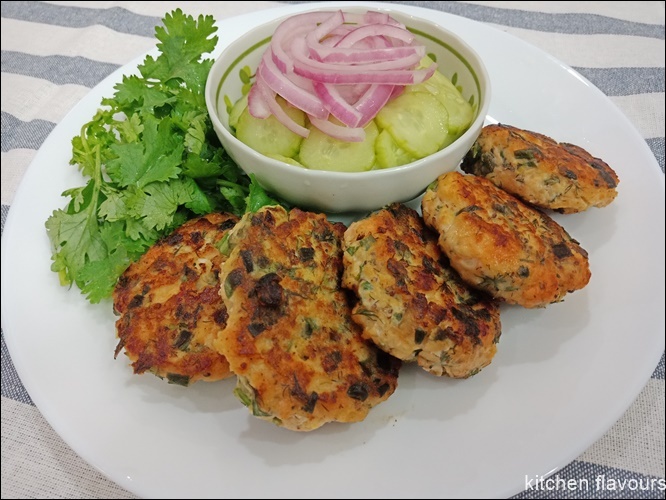 This month's selection at Cook the Book Fridays where we are currently cooking from Everyday Dorie, is Salmon Burgers. Thanks to the feed-back from the lovely ladies at CtBF, that the salmon mixture was very soft, and the burger patty was not holding on to it's shape during frying, I've made some adjustments to the ingredients. The burger mix ingredients are ; chopped salmon fillets, Greek yoghurt, chopped herbs (of which I've used scallions, dill, and cilantro), Dijon mustard, grainy mustard, capers, lemon zest, salt and pepper. I've reduced the amount of sour cream (instead of Greek yoghurt as in the recipe), probably using only half the amount, I did not measure. Even then the mixture is still very soft. I added 2 tablespoons of cornflour to bind the mix together. The mix is then refrigerated for at least 2 hours. The salmon mix is then formed into burger patties. Even after chilling, it was still on the soft side, I find that it needed more cornflour to firm it up a little. So I've added 2 more tablespoons of cornflour to the mix. I formed them into smaller patties and fry them on both sides until brown. These patties hold their shape and did not fall apart. I made the onion pickles and cucumber pickles as suggested by Dorie. But instead of using the patties to make Salmon Burger Buns, we ate the patties as part of our meal with rice. they look like they turned out great for you! We didn't end up using any binder in ours; though refrigerating for the 2 hours helped. I love the idea of the salmon with rice, and the pickles would be great with that as well! I made flatbreads to go along, vs a bun. Happy that your additions helped you with getting them browned - yours look wonderful with their nice color! Wow! they look perfect and so inviting. I just loved all the flavors and will definitely make these again. They are my favourites and the pickles look very appetizing too. Your patties look so inviting, and perfect. From the look of the patties, can't tell they are so soft and hard to turn in the pan. Yours look perfectly browned and crispy. Corn flour sounds like an interesting binder choice. I made the recipe as written (though I halved it) and didn't have any problems with the patties. I seem to be in the minority, though. Yumms! Looks great, clever to use cornflour (I totally forgot about this)! What I like about adding the cornflour is that you end up with that nice browning on the burgers! I could also see reducing some of the wet ingredients, as you did. thanks for reporting on your alterations!! Interesting the way some didn't bind and some did. It must have to do with the moisture in the fish. Yours look good! I think these would have been great with rice! We loved the burgers! Yours look great and held together nicely! What a delicious photo. And, thanks for making more suggestions regarding how to serve this and how to keep the very tasty mixture together. I think all of us had some difficulty with holding these burgers together. I want to make them again so will 1/2 the burgers and use cornflour with one batch and Panko with the other. Wow- while I didn't run into any binding issues this time, mine certainly were not the salmon cakes that your plate ended up with. They look amazing and I'll check out your recommendations on binding for future "burgers". Gorgeous photo and results.